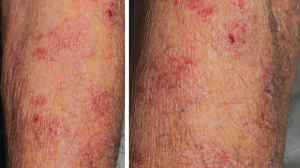 At the end of summer, a 37-year-old woman presented for consultation about a 5-year history of a pruritic rash. The rash originally had started on her neck and had slowly progressed over her face, chest, shoulders, and arms. She reported having similar lesions over the past 5 years that had waxed and waned in intensity. The rash seems to improve (but is still present) during the winter months. She had been seen 1 month ago by her primary care physician, who performed laboratory tests, the results of which showed an elevated C-reactive protein level of 31.3 mg/L (reference range, 0-5 mg/L); findings of a complete blood cell count with differential were normal, and the results of an antinuclear antibody test were negative for autoimmune disorders. 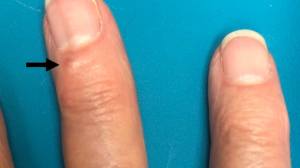 A 7-day prednisone taper and over-the-counter fexofenadine had led to mild short-term relief of the symptoms, but the rash promptly returned. She denied taking any medications or recent herbal supplements. She could not specifically associate the lesions with sun exposure. She denied any systemic symptoms other than low-back pain, which had been an ongoing problem for several years. She was an active 1 pack per day smoker and an occasional social drinker, and she denied any illicit or recreational drug use. Her past medical history was significant for depression, degenerative joint disease, and spinal stenosis. 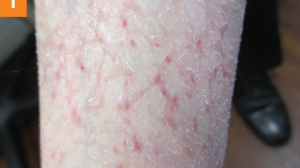 On physical examination, she had multiple scattered, erythematous, nonscaly papules ranging from 0.5 to 1 cm and occasionally coalescing into annular plaques. The lesions were located in a photodistributed pattern over her face, neck, shoulders, upper back, and arms (Figures). No wheal could be provoked by stroking or rubbing the skin. What is responsible for the woman’s lesions? 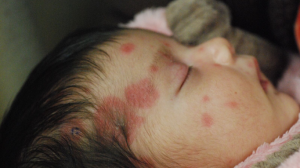 Among the initial differential diagnoses considered were systemic lupus erythematosus (SLE), cutaneous lupus erythematosus, tumid lupus erythematosus (TLE), reticular erythematous mucinosis, polymorphous light eruption, urticarial vasculitis, and telangiectasia macularis eruptiva perstans. Laboratory tests were performed, with negative results for the following: antihistone antibodies, ANA, anti-Ro/SSA antibodies, anti-La/SSB antibodies, anti-Smith antibodies, anti-U1RNP antibodies, and anti-double-stranded DNA antibodies. Rapid plasma reagin test results also were negative. The CRP level was 3.7 mg/L (reference range, 0-1 mg/L), and the erythrocyte sedimentation rate was 64 mm/h (reference range, 0-20 mm/h). A punch biopsy of the lesions was obtained, the histologic test results of which are described in Figures 3 and 4. Figure 3. 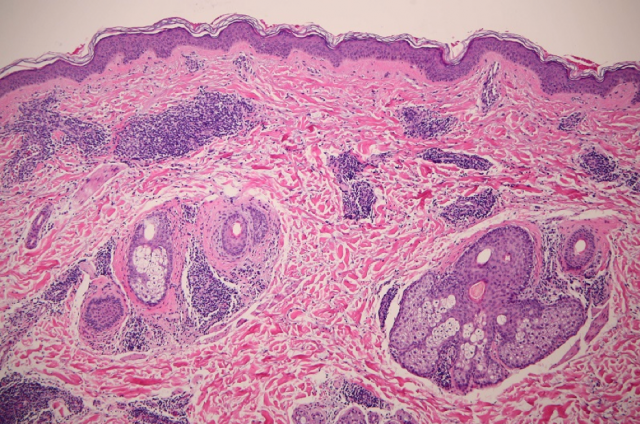 Histology results of a punch biopsy specimen showing superficial and deep perivascular lymphocytic infiltrate with increased dermal mucin, suggestive of TLE (hematoxylin-eosin, original magnification ×4). Figure 4. 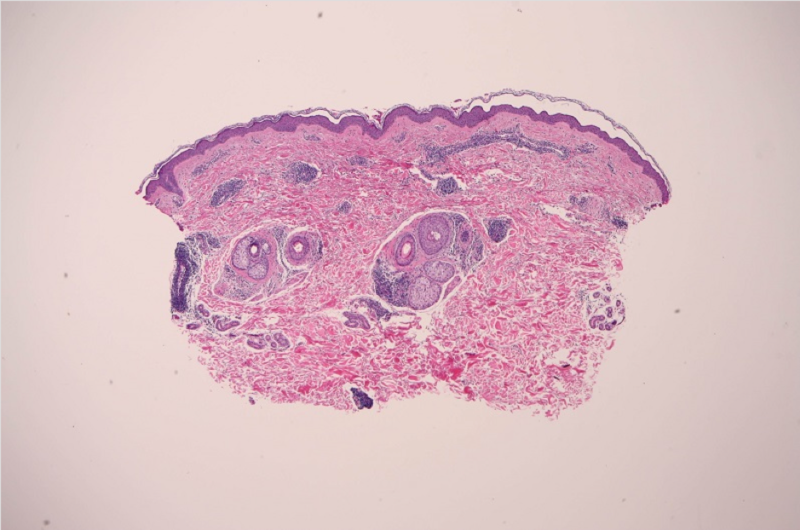 Histology results of a punch biopsy specimen showing more perivascular and periadnexal lymphocytic infiltrates. Note the lack of interface changes (hematoxylin-eosin, original magnification ×10). Based on the patient’s history, physical examination findings, and laboratory test results, she received a diagnosis of TLE. 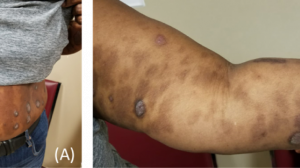 TLE is an uncommon variant of chronic cutaneous lupus.1,2 It is more common in young women,3 and it typically presents as a rash with a photodistributed region on the face, V-neck, chest, back, and extensor surfaces of the upper arms. 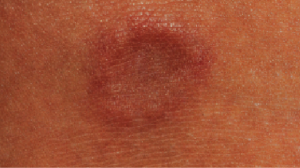 The lesions of TLE are commonly erythematous, nonscaly papules, plaques, and nodules. Patients usually have photosensitivity but typically are otherwise asymptomatic. 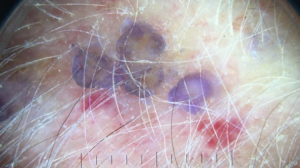 Photosensitivity and photodistributed rash should prompt placing TLE in the list of differential diagnoses. Most patients have negative or normal serologic test results for lupus and other autoimmune disorders,3 as was the case with our patient’s laboratory test results, including ANA and anti-Ro/SSA and anti-La/SSB antibodies. A majority of patients with TLE do not have concurrent systemic diseases. 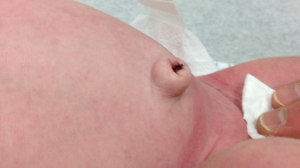 In general, the lesions of TLE are self-limited with a good prognosis. The current treatment recommendation is antimalarial agents, specifically hydroxychloroquine. Our patient was placed on hydroxychloroquine, 200 mg twice daily. In addition, smoking cessation was advised, given that smoking can worsen cutaneous lupus. UV-protective measures were also stressed to our patient. At this writing, her clinical improvement was pending follow-up. 1. Maize JC Jr, Costner M. Tumid lupus erythematosus: a form of lupus erythematosus. Arch Dermatol. 2010;146(4):451. 2. Callen JP. 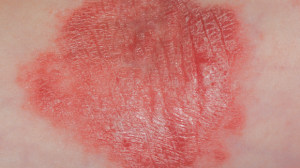 Clinically relevant information about cutaneous lupus erythematosus. Arch Dermatol. 2009;145(3):316-319. 3. Hsu S, Hwang LY, Ruiz H. Tumid lupus erythematosus. Cutis. 2002;69(3):227-230. 4. Perez G, Kowalczyk JP, Montie D, Nousari CH. Tumid lupus erythematosus at the site of a scar. Arch Dermatol. 2009;145(3):343-344. What Is This Ulcerated Nodule on an Older Man’s Scalp? Can You Identify This Tender Nodule on a Woman’s External Ear?